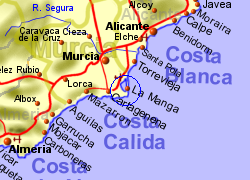 Mar de Cristal is a relatively modern, low rise development, on the southern edge of the Mar Menor (shallow inland sea) on the Costa Calida, Murcia province, close to the village of Los Belones. 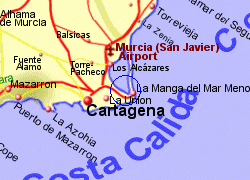 There are some excellent safe beaches lined with palm trees nearby plus water sports (there is a small marina) and various other sporting facilities on land (golf and tennis), and the historic city of Cartagena is approximately 20Km away. The surrounding area is fertile flat land mostly growing vegetables. There are a small number of bars/restaurants and shops. 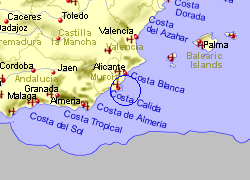 Map of the Mar de Cristal area.